Behind the scenes with Buncombe County Fork2Farmer. Photo courtesy of D. Morais, People-1st Tourism Lab. With just a few more weeks of winter, many of us are dreaming of warmer weather and fun activities outside. That vision draws many North Carolinians and out-of-state visitors to plan extended summer vacations in North Carolina to enjoy our state’s verdant mountains and white-sand beaches. A large number of visitors opt to book a self-catered vacation rental (i.e., a cabin in the mountains or a beach condo on the coast) for a week, due to a perception of better value and convenience. As a result, many vacation home renters arrive to their destination with home-bought groceries in an attempt to optimize their precious few days of vacation. 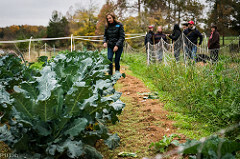 Duarte B. Morais, Becky Bowen, Susan Jakes and other colleagues in the USDA-funded Fork to Farmer (f2F) project realized that this represented a significant revenue loss for NC farmers and set out to develop a new way for farmers to tap into NC’s burgeoning tourism economy. Vibrant produce from Buncombe County. Photos courtesy of D. Morais, People-1st Tourism Lab. 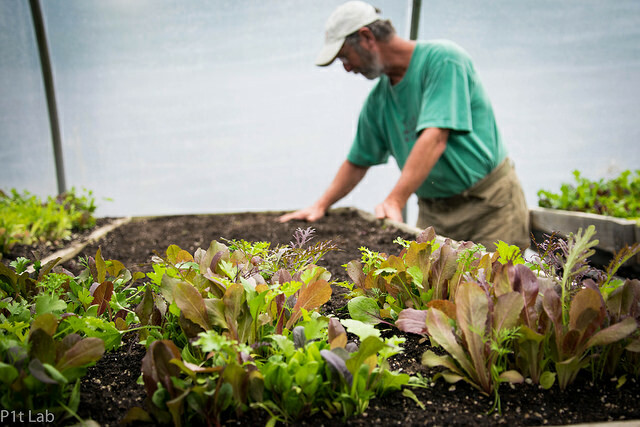 The concept of Vacationer Supported Agriculture (VSA) consists of coordinating the sale of weekly fractions of farm production shares over the tourism season. A group of farmers decides how many farm shares they want to sell, and vacation renters are invited to pre-buy a week fraction of those shares (i.e., vacationers can buy a bag of produce from farmers local to their host destination). The f2F project first works with farmers and local Extension agents to define the produce bags and their delivery to the vacation rentals; then the team works with realty companies and local tourism development authorities to promote the produce bags among vacationers. Finally, the team works with an internet retail company to administer the online pre-vacation sales and the disbursement of payments to farmers and delivery micro-entrepreneurs. A tour at one of the contributing farms, in Pittsboro, NC. Photos courtesy of D. Morais, People-1st Tourism Lab. VSA was piloted last summer in Ocean Isle Beach under the local name “Vacation Vittles.” In that location, the produce bags were assembled by farmers from Brunswick, Bladen, and Columbus Counties. Cooke Realty was a key local partner, playing the important role of encouraging their vacationers and property owners to pre-order produce bags for the weeks they intended to be there at the beach. In addition, the local civic organization, Men and Women United for Youth and Families, involved its youth ambassadors in packaging the produce in the bags and in delivering them to vacationers on Saturdays when they checked-in at Cooke Realty. Multifaceted feedback about last summer’s pilot of the VSA initiative in the NC coast suggests that this model is connecting vacationers with fresh local produce – it helps realty companies showcase their commitment to neighboring communities and working lands; it can afford professional development opportunities to local aspiring youth; and it can afford an important new revenue stream to groups of small farmers near tourism destinations. Based on this encouraging first pilot, the project team will be expanding the initiative to several new destinations on the coast and in the mountains. The Fork to Farmer principal investigators, the project manager, the research assistant, and key local partners won an N.C. Cooperative Extension Service Foundation Search for Excellence Award for the Southeast District, sponsored by NC Grange. 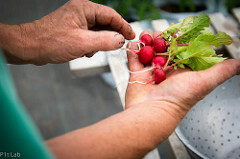 For a closer look into the Vacation Supported Agriculture pilot in Ocean Isle Beach, you can watch this short video produced by Bruno Ferreira. For any inquiries please contact Becky Bowen at blbowen@ncsu.edu.